ANOTHER CUP OF COFFEE- OUT IN PAPERBACK IN UK AND USA!!! 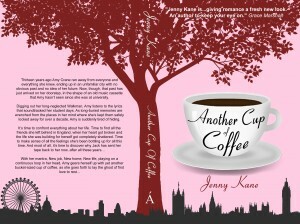 Posted by Jenny Kane on Sep 19th, 2013 in Blog | Comments Off on ANOTHER CUP OF COFFEE- OUT IN PAPERBACK IN UK AND USA!!! I’m happy dancing- which is silly of me really, because I’m slopping my coffee everywhere- but who cares, because my very first romance novel is out in PAPERBACK today!!! I can’t wait to get my copy!!! Thanks so much for your support everyone- happy reading! !